Meet Jeff! Jeff has been called “Pokey” since his teen years, as an abbreviation of his last name. Jeff has a smile you can’t miss and is known around DSC for his amazing work ethic. He has loved coming to work at DSC the early 1990’s. His all-time favorite thing to do at DSC is to get right to work. At DSC, Jeff shreds documents, cleans off tables after lunch and goes park walking with other consumers. This contract job through the Champaign Park District is a favorite amongst consumers! 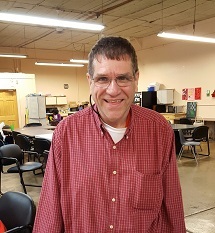 Jeff also enjoys helping out with the DSC garden whenever he can by pulling weeds and watering plants. In his free time, Jeff likes to spend time with his parents, ride a tandem bicycle with his father and watch television. Jeff also enjoys going out to eat, and one of his favorite places to eat is Stonecreek Country Club.